It’s A Charlie Brown Halloween! 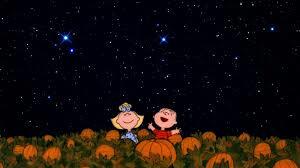 The trailer for the upcoming peanuts gang film “The Peanuts Movie” started me thinking that not everyone may be into scary Halloween movies, so I decided to share a favorite TV special from childhood, “It’s the Great Pumpkin, Charlie Brown”. “The Peanuts Movie” opens November 6th and is from the genius imagination of Peanuts/Charlie Brown creator, Charles M. Schultz. In this trailer, we hear from the creators of “The Peanuts Movie” about Schultz’s drawing style and concepts. This film will be the Peanut gang’s big screen debut. The plot revolves around Charlie’s best friend Linus’ belief in the Great Pumpkin who supposedly comes to the pumpkin patch to reward faithful boys and girls. Despite everyone telling Linus what a fool he is for his conviction, he still keeps the faith. Unfortunately, the night is a complete bust for Charlie who with his bad luck always gets a rock (Maybe it’s because of his jacked up ghost costume with eight million holes in it.) and Linus who never meets the elusive Great Pumpkin. As a child, I remember one of the most important decisions of Halloween being the selection of just the right costume so you can proudly walk up to your neighbors doors screaming, “trick or treat!” Opening up your bag and gleefully anticipating scoring one of your favorite Halloween treats. For me, it was always Snickers, hands down. There’s nothing worse than the wrong costume coupled with lousy treats. And in Charlie Brown’s case, a stupid rock. Great, thanks a lot! Another crucial choice of the Halloween tradition is picking and carving just the right pumpkin. This is how Miss Lucy Van Pelt handles a pumpkin and her little brother, Linus. Plus, the gang gets a little fright in the pumpkin patch. But, how much fun would the evening be without a little ghosts and goblins scare. We were first introduced to Charlie and the gang in the television premiere of “A Charlie Brown Christmas” which still remains a perennial favorite. In my house, to this day, “Charlie Brown” and “How the Grinch Stole Christmas” are required viewing as part of the official Christmas season. The television special was based on the comic strip Peanuts, by Charles M. Schulz. Produced by Lee Mendelson and directed by Bill Melendez, the program made its debut on CBS on December 9, 1965. With the success of “A Charlie Brown Christmas”, other specials were developed featuring the lovable Peanuts Gang. “It’s the Great Pumpkin, Charlie Brown” was the third Peanuts special and its’ initial broadcast took place on October 27, 1966. For me, “It’s The Great Pumpkin, Charlie Brown” brings back fond memories of those magical childhood days and offers up a laugh or two along the way. This entry was posted in Animation, Comedy, Writers and tagged Charles M. Schultz, Charlie Brown, Halloween, Halloween costumes, Peanuts, pumpkin carving, pumpkins, trick or treat. Bookmark the permalink. Yes! I definitely fall into the category of: no scary movies for me, please. This is a classic. Haven’t caught it in years but you’ve inspired me!